The Incorporable A.R.Rahman Joins Rukus Avenue's fight to end Human Trafficking and will feature music on the Rukus Avenue-United Nations album titled Music To Inspire. The Artists United Against Human Trafficking album will release on the 31st of January worldwide and will be announced at the United Nations headquarters in New York City. The album will feature a whopping 60 tracks and is considered the largest collection of artists coalition for a charity since Band-AID in the 1980s. We all have a chance to make a difference with this album, so please go out and support it and spread the word! DissDash recognized Rukus Avenue with a very coveted Record Label of the Year award as the the popular blog rolled out its "Best of" for 2016. The awards included many other noteworthy members of the South Asian community in the United States. This is a special note for Rukus Avenue as its in its 20th year this year. Thank you to our friends at DissDash.Com for the recognition! The White Initiative album Act To Change is a collaboration with Rukus Avenue and features 25 tracks of music and audio pieces that inspire the fight against bullying. The opening piece to the album is delivered by none other than President Barack Obama and First Lady Michelle Obama, as they address the social need to fight bullying. The President refers to the movement as an important social issue and calls for support for all our nation to step up and make a difference. He notes that this is a social issue that seldom finds the front pages of the media and needs the awareness to battle it on multiple levels. The First Lady also talks about the importance as, not only President & First Lady, but as parents to bring attention to this problem that our youth faces. Since the Asian-American population in this country are statistically more likely to be targeted, the White House Initiative for Asian Americans and Pacific Islanders have mobilized with Rukus Avenue to put an album together to help bring much needed attention to the issue. The action packed anti-bullying album by Rukus Avenue goes live on Dec 7th, 2017. 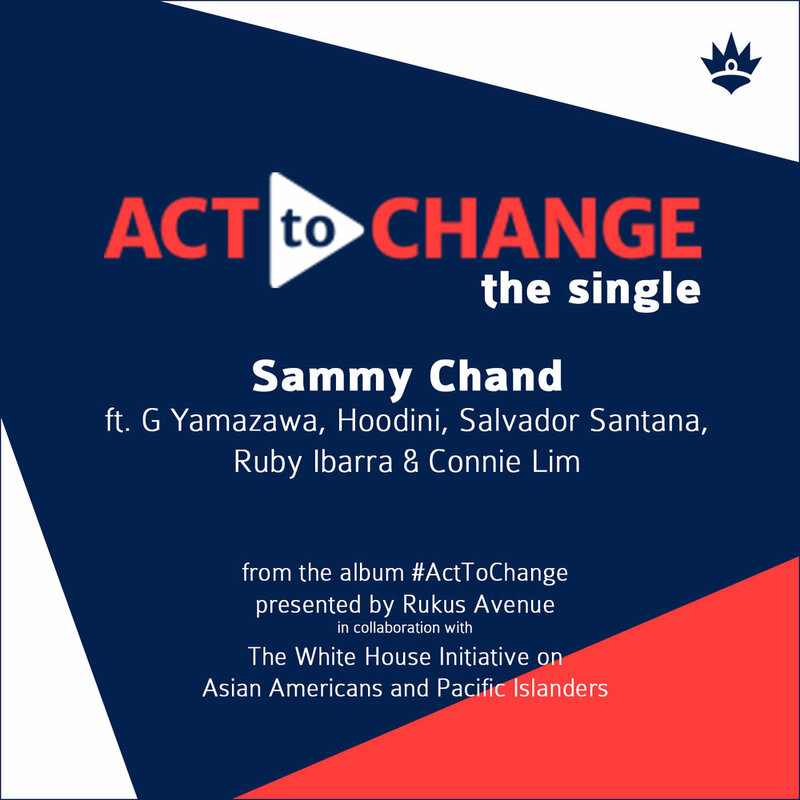 The Sammy Chand produced single Act To Change is also featured on the album and showcases some of the finest in Asian American artists on one album. The song also features G Yamazawa, Hoodini, Salvador Santana, Ruby Ibarra & Connie Lim. Head on over to iTunes on Dec 7th and checkout what all the hype is about. The album also features President Barack Obama and First Lady Michelle Obama as the opening audio piece to introduce the White House initiative. The dynamic single features musicians Joey Santori and acclaimed Roma-Gypsy musician Oliver Rajamani and is mixed by Rukus Avenue's own Jack Atlantis. Let us know what you think of the single! Email us at info@rukusavenue.com! Rukus Avenue is honored to be working alongside President Obama's govemment-wide White House Initiative on Asian American 8 Pacific Islanders to start a brand new music project to address bullying. Our goal is to produce and curate a compilation that features musicians and personalities from Asian American 8 Pacific Islander community that brings awareness, educates, and activates prevention of bullying amongst our youth. The ACT TO CHANGE music movement will feature music and other audio pieces that inspire our youth to be more aware and sensitive of communication and actions that are divisive or abusive. The acceptance of all of our differences has never been more quickly achieved than by utilizing the true essence of the binding power of music. We are proud to send all proceeds of this album to the #ActToChange campaign and work along the White House Initiative to serve the AAPI community. We thank you for joining our mission to make a change! Highlighting legacy and action in the Asian American and Pacific Islander community under President Obama and beyond. Fast Forward 2060 is a free, public pop-up exhibit and event on December 7, 2016 in Washington, DC that highlights Asian American and Pacific Islander (AAPI) progress under President Obama and beyond. AAPIs are the fastest growing racial group in the U.S. They are more than 20 million strong and expected to double to over 50 million by 2060. Join us for an afternoon of interactive exhibits, speaker sessions, and opportunities to engage digitally and in-person. The United Nations and Rukus Avenue have teamed up to raise money for the United Nations voluntary trust fund to end Human Trafficking. Rukus Avenue will put together a music compilation that will feature artists from around the world to bring awareness and much needed attention and resources to continue their worldwide initiatives. The Wu-Tang Clan is in the building! Cappadonna & Sammy Chand! Producer Sammy Chand's signature hip hop beats fuse with Cappadonna from the Wu Tang Clan to form a dynamic new sound. Filmed in Los Angeles the music video features Cappadonna and Sammy Chand as they enter their secret venue. The Great collaboration between two worlds of music as the Wu-Tang Clan's Cappadonna and Sammy Chand strike up a brand new sound. The track called HANDS UP is the mixture of the gritty hip hop sound of Cappadonna with the edgy fusion of Rukus Avenue. Sammy Chand's video with Cappadonna has a cool video shot in Los Angeles. The track was produced by Sammy Chand and fuses the tabla of Sunil Kalyan with Guitars, strings and an banging hip hop ensemble to come up with a very lively song. Aptly titled Hands Up the video has become a viral sensation. The Rukus Avenue presented show RHYTHM VILLAGE at this year’s Indian Film Festival of LA will feature Bhangra Superstar Jassi Sidhu. The show will take place at the beautiful Supper Club in Hollywood, California, on the 12th of April, 2012. Also in the lineup will include Elephants with Guns, Bombay Dub Orchestra, DJ Ben G, and Doc Bladez. The show will celebrate the 10th anniversary of the Indian Film Festival of LA and the 5th anniversary of Rhythm Village. Come join us at the Supper Club for a very special night in Los Angeles.